Everything that slows us down and forces patience, everything that sets us back into the slow circles of nature, is a help. Gardening is an instrument of grace. Did someone say spring fever? Yes, I am feeling anxious for summer. Even though I try to be the kind of person who views the glass as half full, believe me when I say that I gave winter the evil eye this year. Yes, I live in the Upper Peninsula of Michigan. Yes, I have lived here for most of my forty-six years. Yes, I know that I should savor each moment and wish life to move fast forward. Still, I find myself wistful for long hikes and vases full of fresh-cut flowers from my back yard. 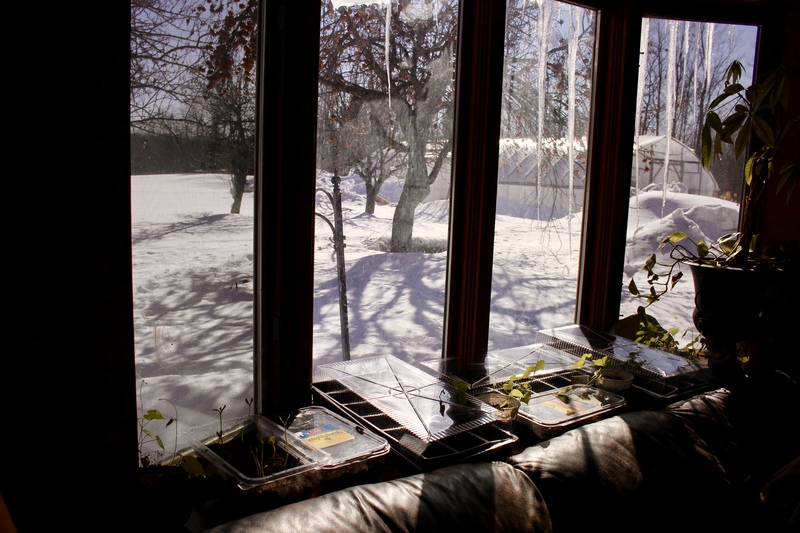 I watch the chickens preen in the sunshine and I eagerly anticipate long daylight hours filled with warmth and all of the possibility that we can gather in a few short months. 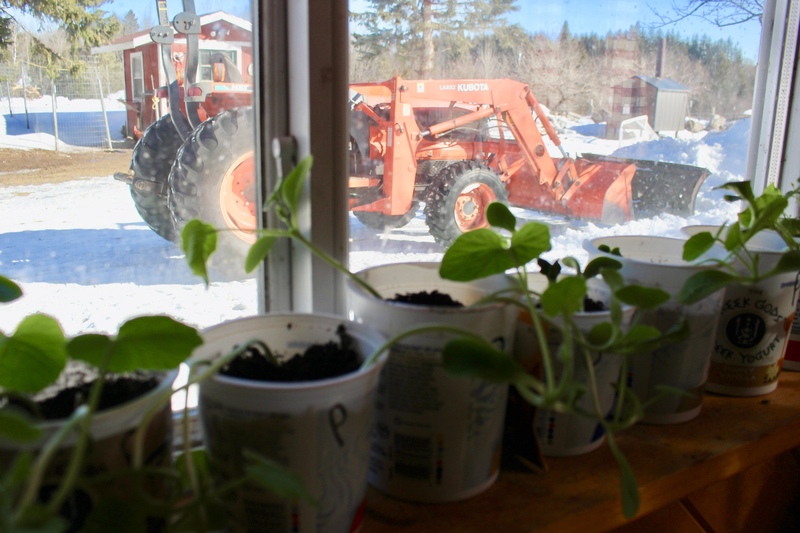 Since my family is fortunate to have a hoop house, April will be planting season for us and we are investing a lot of sweat equity into our garden this year. 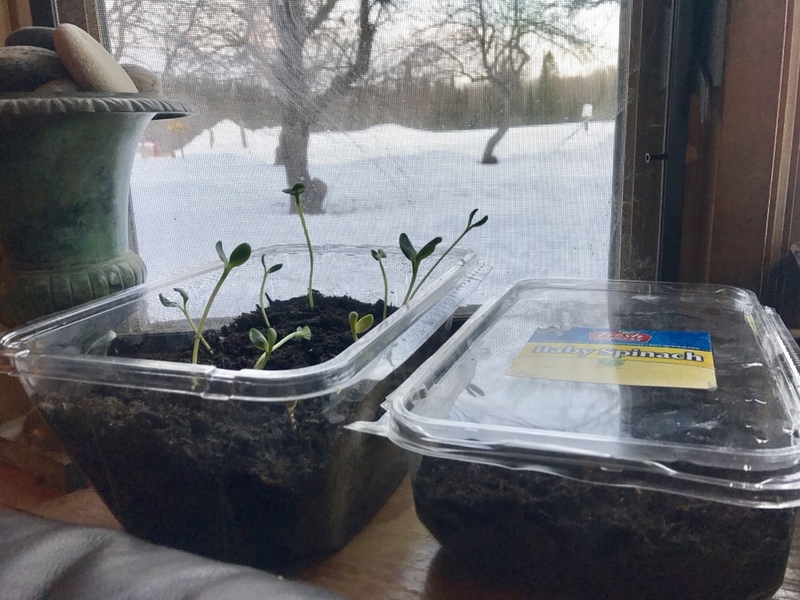 For a couple of months now we have been starting seeds in our house. My husband John started broccoli, Brussels sprouts, pumpkin, watermelon, and an assortment of flowers. Last weekend I started tomatoes and cucumbers. 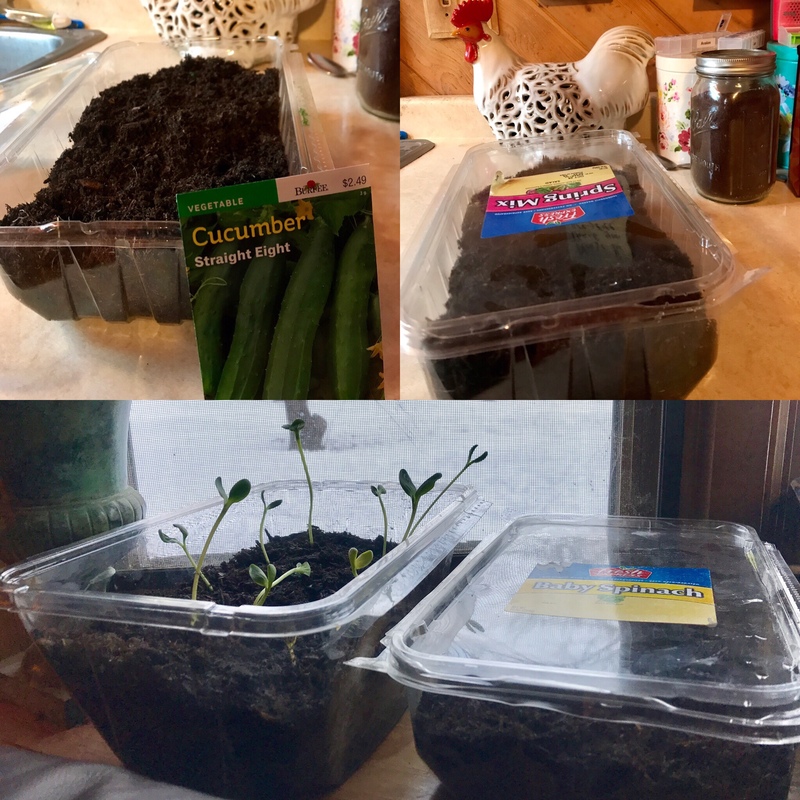 Check out the “mini-greenhouses” I used to plant cucumbers and recycle the large clamshell containers that greens come in from the supermarket. In the fall it was difficult to go back to buying greens for salads and smoothies after being able to grow our own all spring and summer. We have a tiny house but we maximize our space and take advantage of the wonderful sunlight. 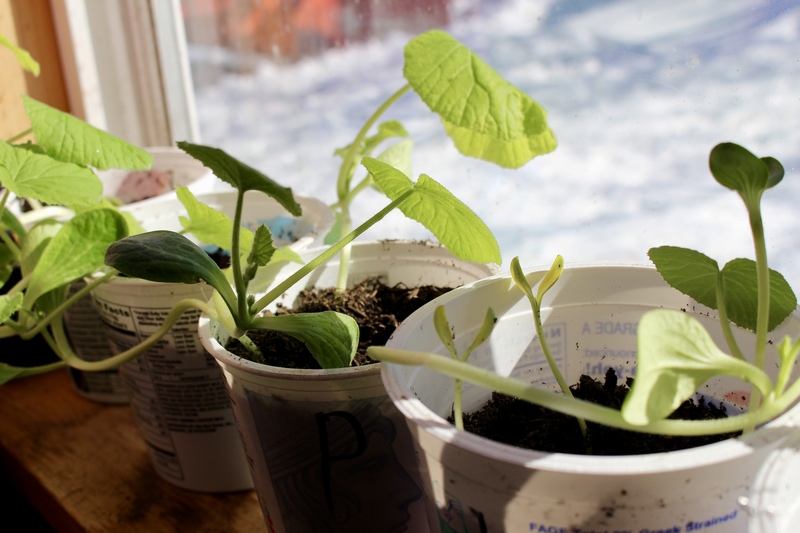 This weekend I am picking up squash seeds (zucchini, yellow summer squash, spaghetti squash, and butternut squash) to also start indoors. While we still have several feet of snow on the ground, on sunny days the temperature is reaching the low 70s in the hoop house. 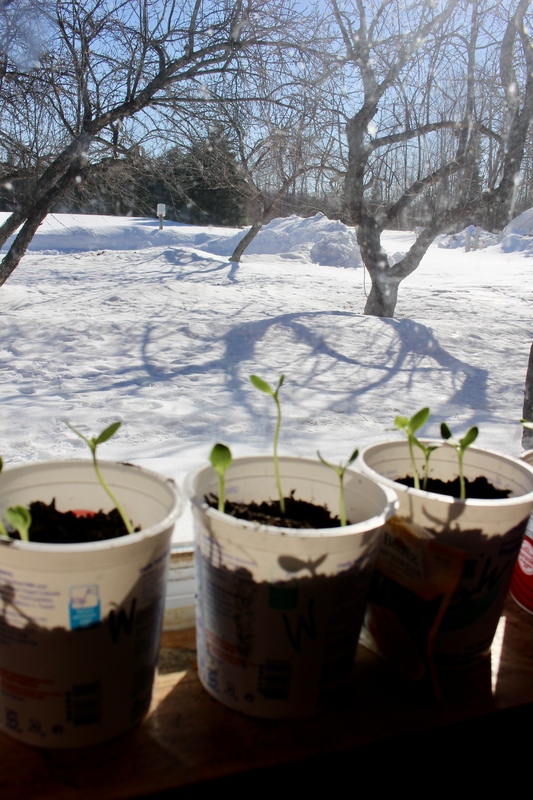 I can already taste the green beans, broccoli, and peas and I cannot wait to be able to pick fresh greens daily for salads. When I make salads as an entrée for work or dinner, I like to bulk them up with ingredients that are going to have staying power. I love to add beans or nuts for protein and whole wheat pasta, other grains, or quinoa. For the salad that I am sharing with you this month, I decided to use rice noodles – because I thought they would work well with the spicy chili lime dressing. I usually have them on hand because my husband and I love them in my hot and sour mushroom soup. Rice noodles come in a variety of textures (for this salad I used a thin noodle) but the thicker strands would work well too. 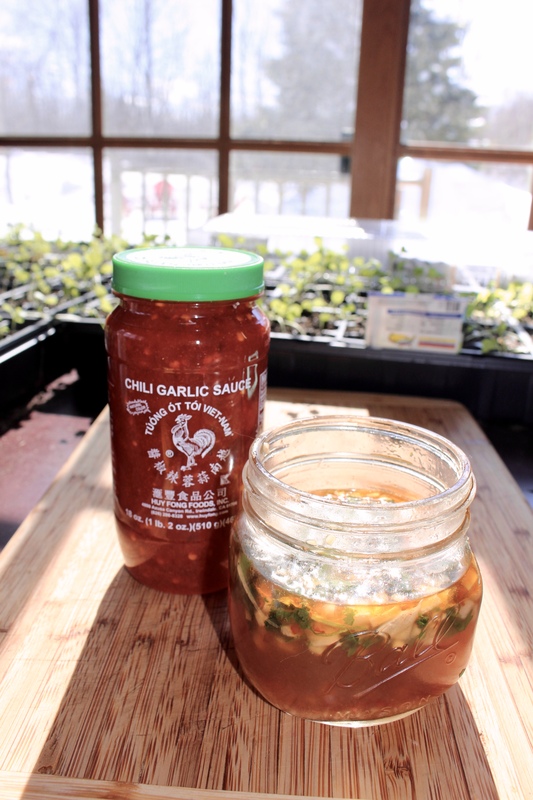 Both the rice noodles and the garlic chili sauce (that I use in the dressing) can be purchased in the Asian section of the supermarket. This salad can be plated or made in a jar. While I used clementine oranges or “Cuties”, pineapple or whatever fruit or berries that are in season would work great. The sweetness of fruit partners well with the spiciness of the dressing. I love to create vibrant salads, since we eat with our eyes first, and I think that taking time to artfully arrange food helps deepen our enjoyment and brings eating to a new level. That is why I enjoy making jar salads. Not only do the jars keep the salads fresh for up to a week, but they help make the salads visually appealing and ready to grab-and-go for work or when you are pressed for time at home. I love being able to prep my salads once for a healthy meal all week-long. Normally, when I make dressing, I use my Vitamix blender. However, for this dressing, I wanted a chunkier consistency so I added all the ingredients into a pint-sized mason jar, put the lid on and gave it a good shake. 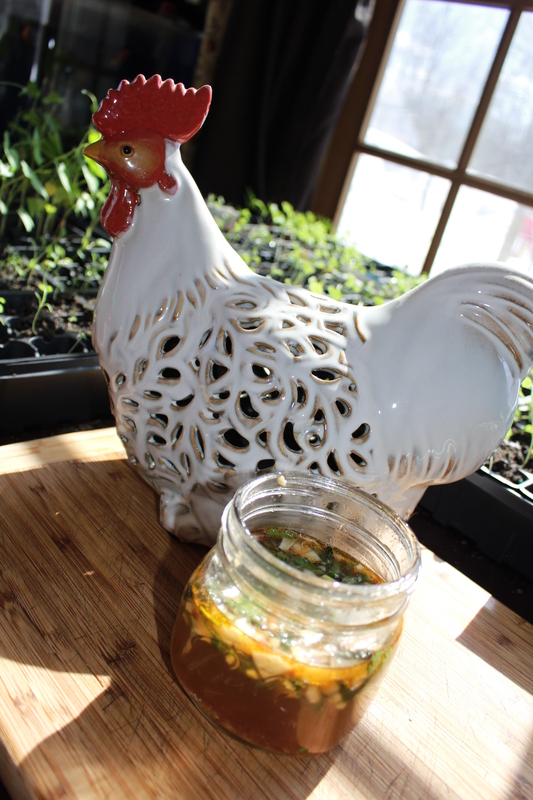 In the summer I also add a sprig of fresh mint and freshly chopped chives to the dressing. 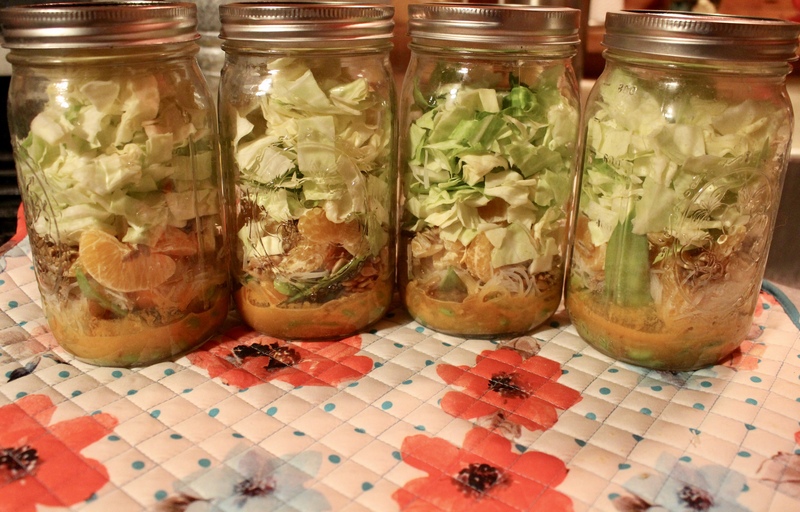 I made four salads using quart Mason jars. You can decide how much of each ingredient to add. 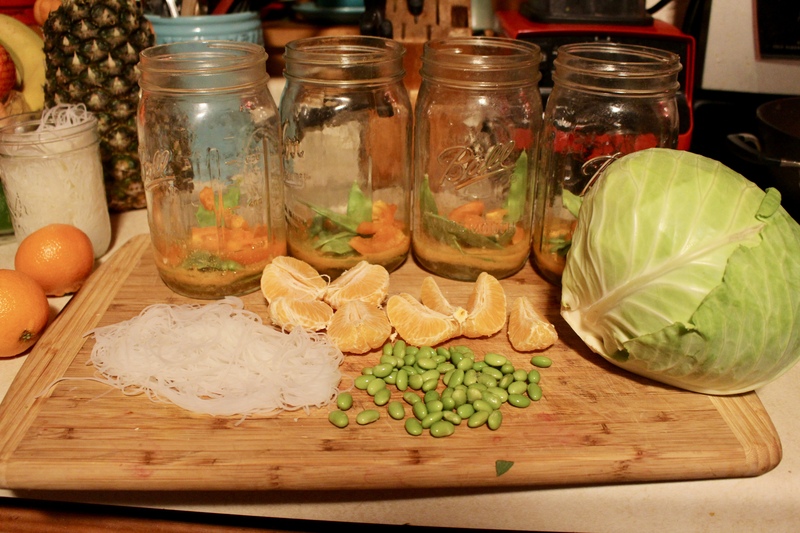 I used ¼ cup each of sunflower seeds, noodles, and edamame. 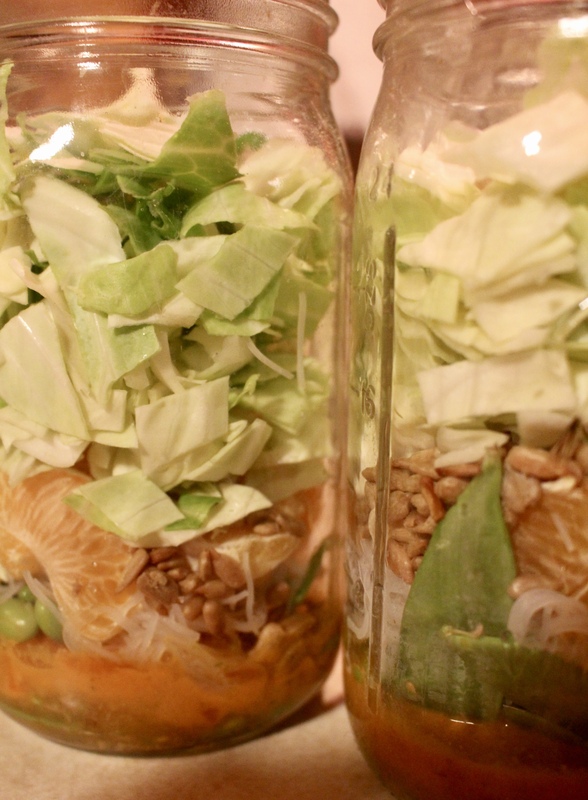 I divided up one small bell pepper, used one clementine per jar, and filled the rest with crunchy cabbage (packing it well to ensure the salad had enough cabbage). Red cabbage works well with this salad as do carrots, tomatoes, broccoli – and if you eat meat you can add chicken or shrimp. 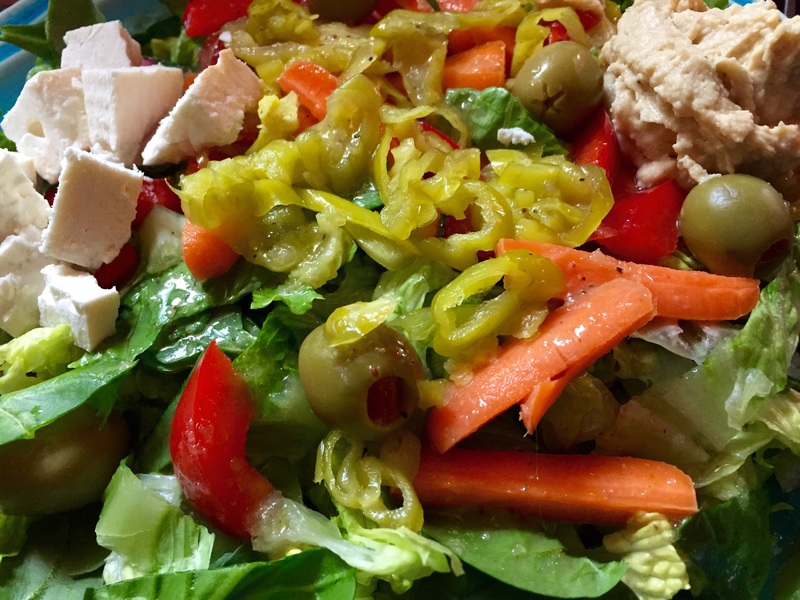 As sure as the geese will return to Upper Michigan skies, this salad will make a great addition to your spring and summer menu. It would be a great dish to bring to a picnic (imagine making small individual salads for everyone in pint jars). The dressing is versatile and while it perks up cabbage or greens in your salad, it is equally delicious drizzled over steamed or roasted vegetables. If you have spring fever like I do, I hope you find a way to satisfy your yearning for warming days. 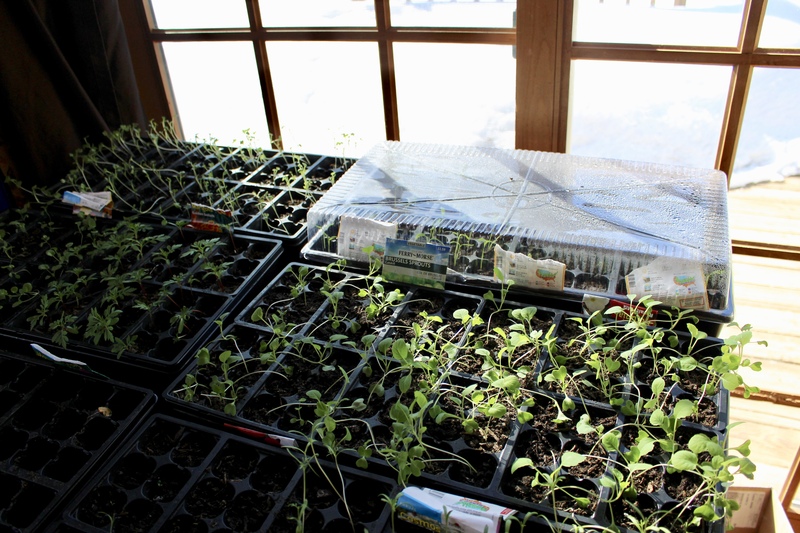 Now is the perfect time to start some seeds indoors for your own vegetable garden. If you have limited space think about growing tomatoes and fresh herbs in containers. You will thank yourself in a few months when you are making salads from your own fresh produce. Trust me, food always tastes better when it is grown and prepared with a labor of love. We do not have to look at the calendar to be reminded that the winter holiday season is upon us. Christmas displays started popping up in stores right along with jack-o- lanterns, while television commercials repeat a dizzying array of gift ideas. Not to mention that we all have that one friend on social media who has their Christmas shopping finished at the end of September. Unfortunately, I am not that friend. Though every year I want to be. Leonardo da Vinci said, “Simplicity is the ultimate sophistication.” As my husband and I try to become more self-sufficient in our food production, I have embraced the idea of rustic elegance when it comes to meals. Not only does it suit the farm-to-table lifestyle, but it can be an efficient way to cook. serve a busy schedule well – especially during the hustle and the bustle of the holidays. For example, a large pan of roasted Brussels sprouts can be a healthy holiday side dish and the leftovers can hearty up a breakfast quiche, add flavor to a spinach salad, or be an unexpected addition to a pasta dish (and with the time you save you can wrap up those last minute gifts). One of the foods that has come a long way from the bad rap that many of us gave it as kids, is squash. Not only does it grow easily in a garden, but it will keep a long time (several months) when stored in a cool place. If you do not have a green thumb, you can find a wide array of squash in the supermarket. 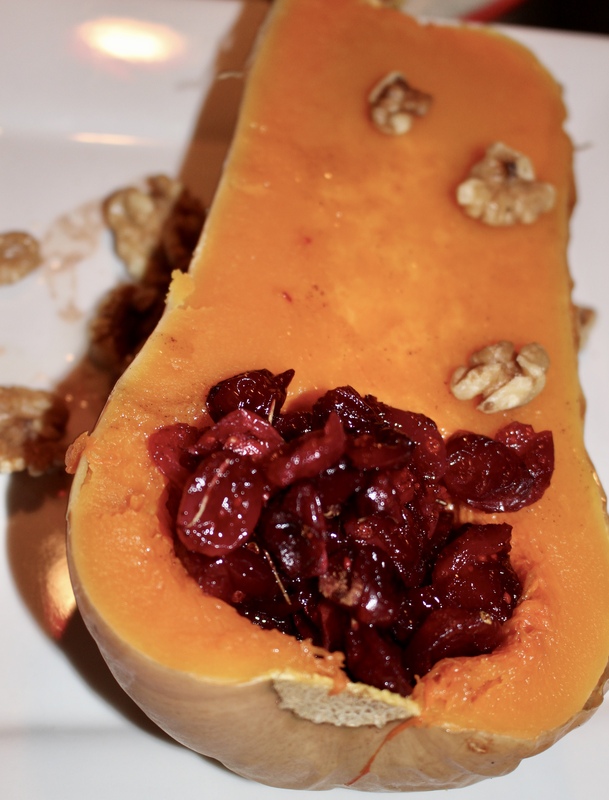 While I am known to use spaghetti squash as a healthy alternative to pasta, I enjoy preparing butternut and acorn squash. Both can be served whole (or more accurately halved) and they can be stuffed with a variety of ingredients (think rice, quinoa, or farro. Nuts, dried fruit, and even sausage). 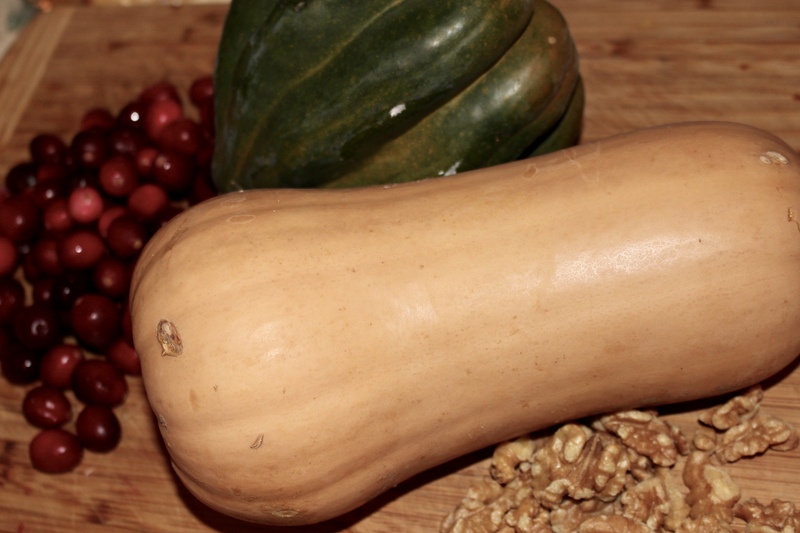 The squash can also be cubed and roasted, or even mashed. Since it can be prepared ahead of time, you can warm it up or serve cold as a salad. As long as you have the oven turned on, you might as well prepare a few extra squash and puree the leftovers with broth (and cream if you’re feeling indulgent) for soup (I also like to add apples to butternut squash soup). Roast squash for 30-45 minutes at 400 degrees. Peel squash and remove seeds. If you want to cube the squash and roast it, you could prepare using the above technique for a shorter amount of time until it is soft enough to cut easily. 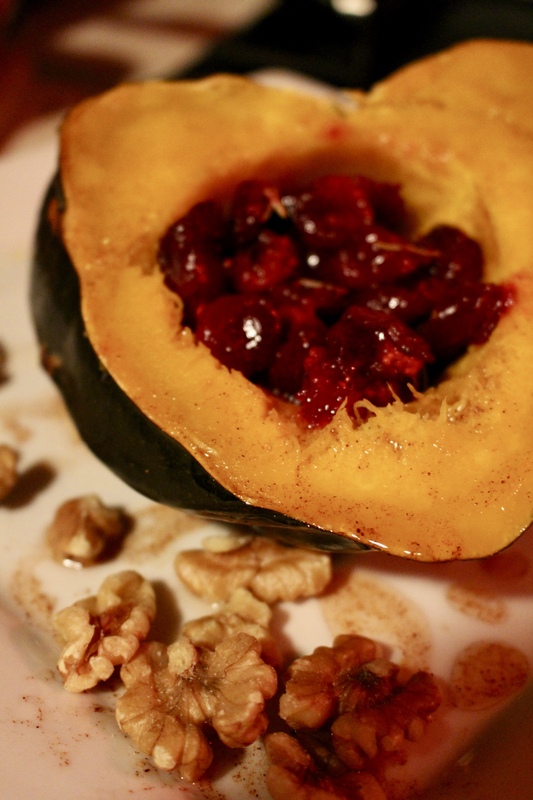 Once you have the squash cut, drizzle with olive oil and spices and roast until slightly caramelized and soft. I recommend serving squash on a large serving platter. For a real rustic feel, do not peel but “scoop” the squash to serve. Pumpkin Vinaigrette. 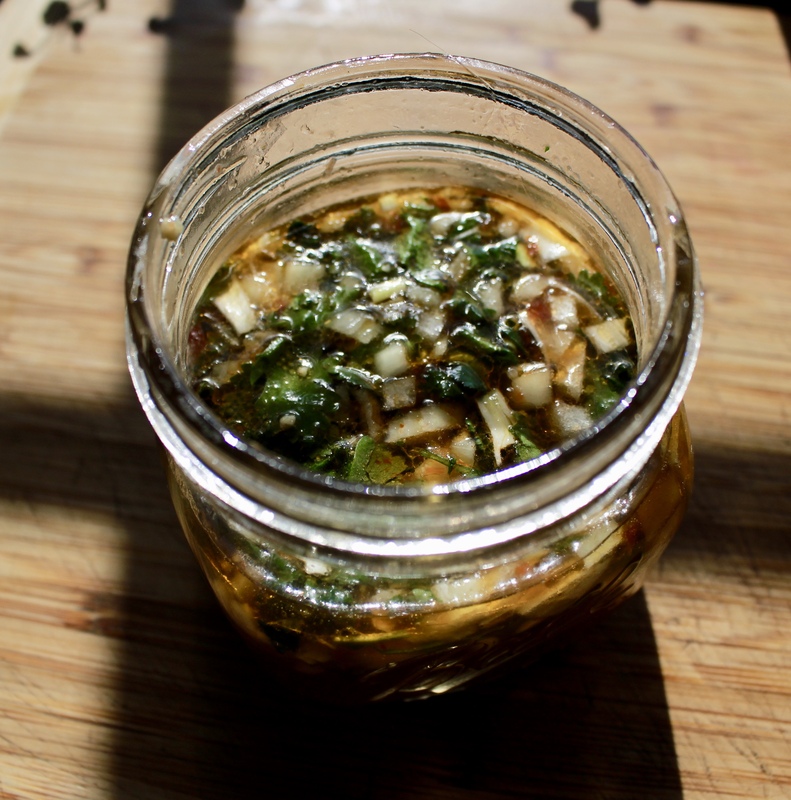 The vinaigrette also makes a fantastic dressing for a green salad and it will keep over a month in the refrigerator. 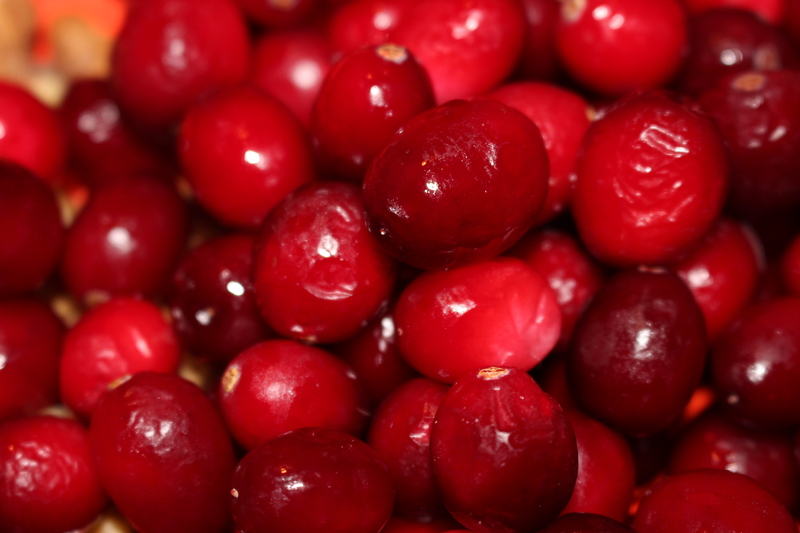 If you have never roasted cranberries before, you are missing out. Not only will your house smell amazing, but the sweet-tart flavor is astounding. Plus, you control how much sugar you want to use. You might want to make a triple batch (or more). 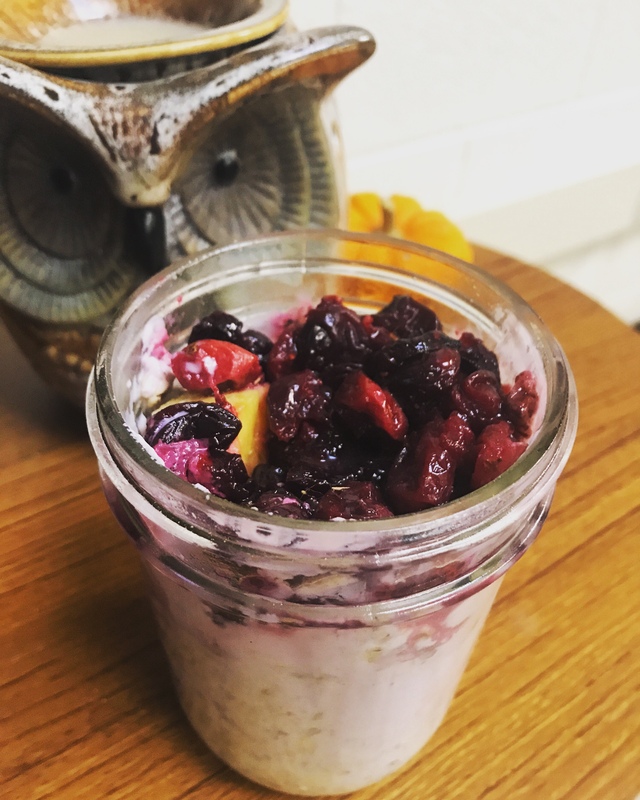 Roasted cranberries are delightful as a topping for oatmeal (hot or refrigerator oats) and they make great appetizers (serve on toasted French bread or crackers with brie or goat cheese). 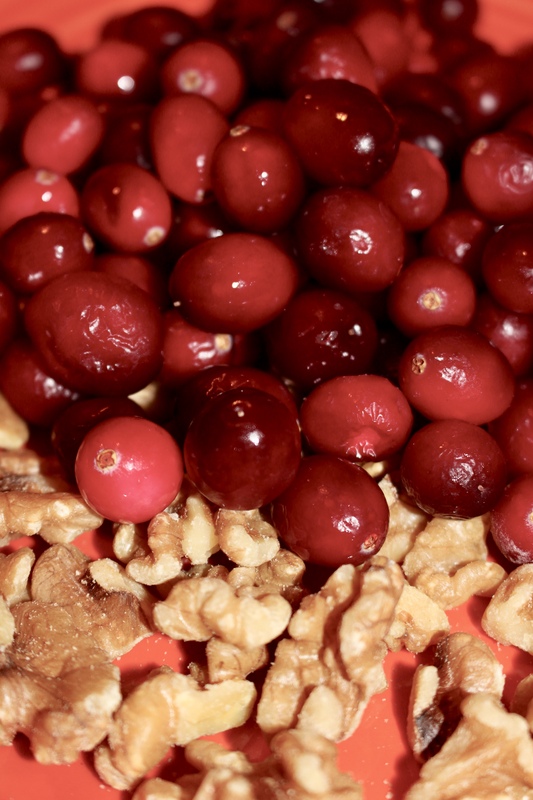 The sweet tart flavor of cranberries is incredible in refrigerator oatmeal. Blend dressing until smooth. The combination of sweet, savory, tart, and spicy ingredients make it a pleasing combination. This holiday season I hope you find many moments to make memories with your friends and family. If you are responsible for preparing a feast, remember that many foods can be made in bulk to serve many recipes and save precious time. Keeping our menus simple and rustic, does not mean that we have to sacrifice taste. Nature provides us with complex flavors and textures. One of the best gifts that you can give loved ones this year is a meal cooked with fresh and wholesome ingredients. 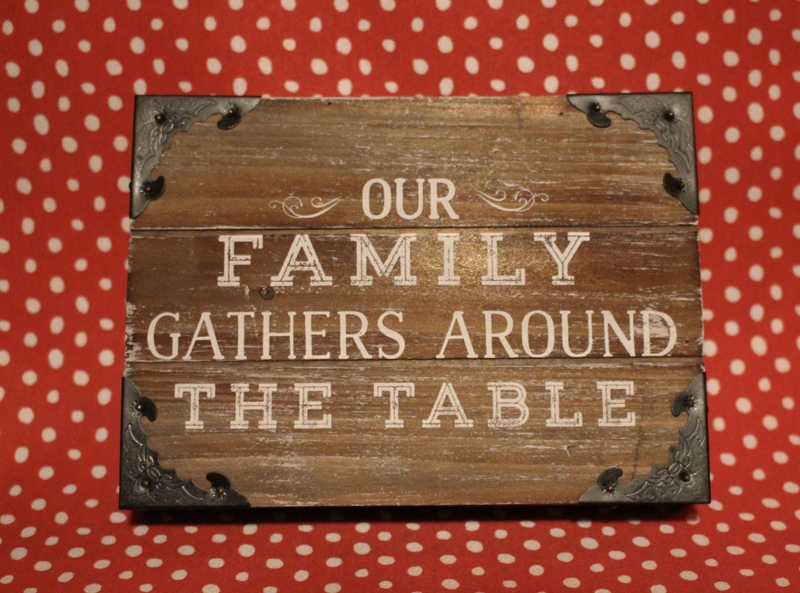 From The Waldo family to yours – may your table be filled with holiday blessings! “There is no technique, there is just the way to do it. When I met John I learned that he shares my love of travel. We have plans to visit Alaska this summer – and he will be the travel director – meaning the vacation will be on his terms. Alaska was never on my bucket list before I met John but he talked so passionately about a trip he took there with his uncle and father that I want to experience the real Alaska with him. We will not be taking a cruise or staying in touristy hotels. We will be roughing it – so to say. I am nervous and excited to venture out of my comfort zone. I promise plenty of blog posts from our adventures. I can get lost in the beauty of our home and land. My friends and family have found themselves shaking their heads in amusement many times over the past year as John encourages me to embrace my true Yooper. This includes helping him split and stack wood to heat our log home, cleaning the chicken coop, weeding the garden in my Bog boots and bikini, and this winter I have even learned how to load the outside wood boiler with logs. Because marriage is about compromise, John has agreed to visit Italy and Greece – on my terms – for my 50th birthday (that gives us a substantial amount of time to save) and I cannot wait to experience the colors and flavors of the Mediterranean. In my mind’s eye I imagine the magic that Mayes describes come to life before my eyes. I am a goal setter and I love having my eye fixed on the future and knowing that John and I can reward ourselves for hard work. It also helps me live more frugally, knowing that being wise with our money will pay off with new experiences and the wisdom gained by travel. In my last post, Time to Make Myself a Priority Again, I shared my struggles in finding time for myself and even for cooking healthy meals. I was waving the white flag at my picky family and relying on processed food – in return I have been feeling less than healthy. 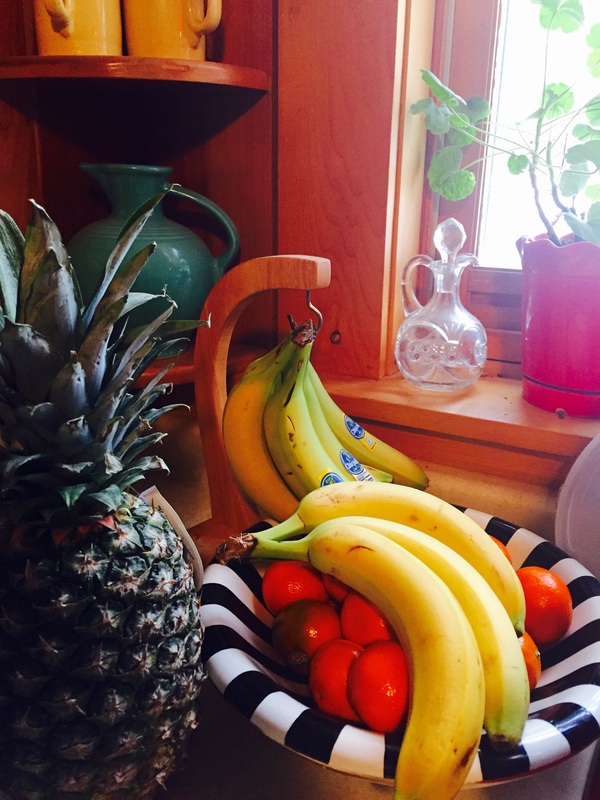 Last weekend an abundance of fresh fruit, vegetables, greens, and berries found their way into my shopping cart and this week I plan a repeat performance. 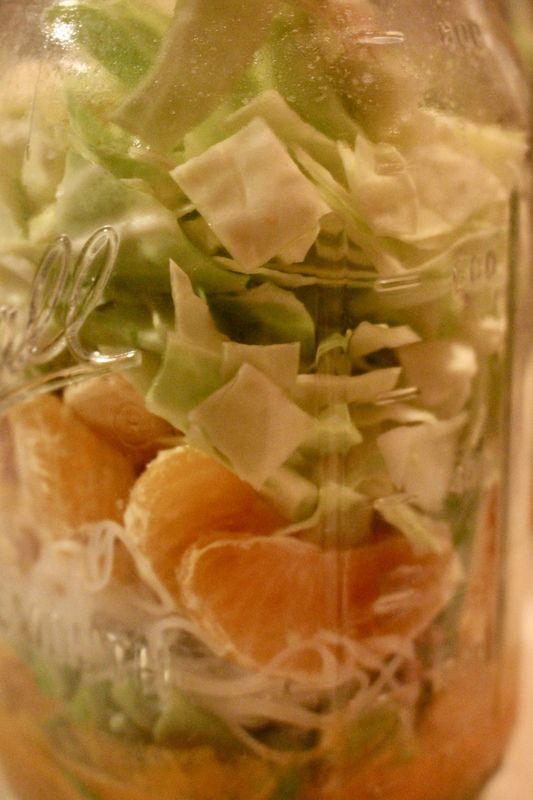 My favorite mid-day snacks at work this week were grapefruit – peeled like an orange. They were so sweet and juicy that sugar was not needed (though I don’t think I’ve put sugar on grapefruit since I was a kid). I love having a bottomless fruit bowl at home. Our kids love bananas and cuties. 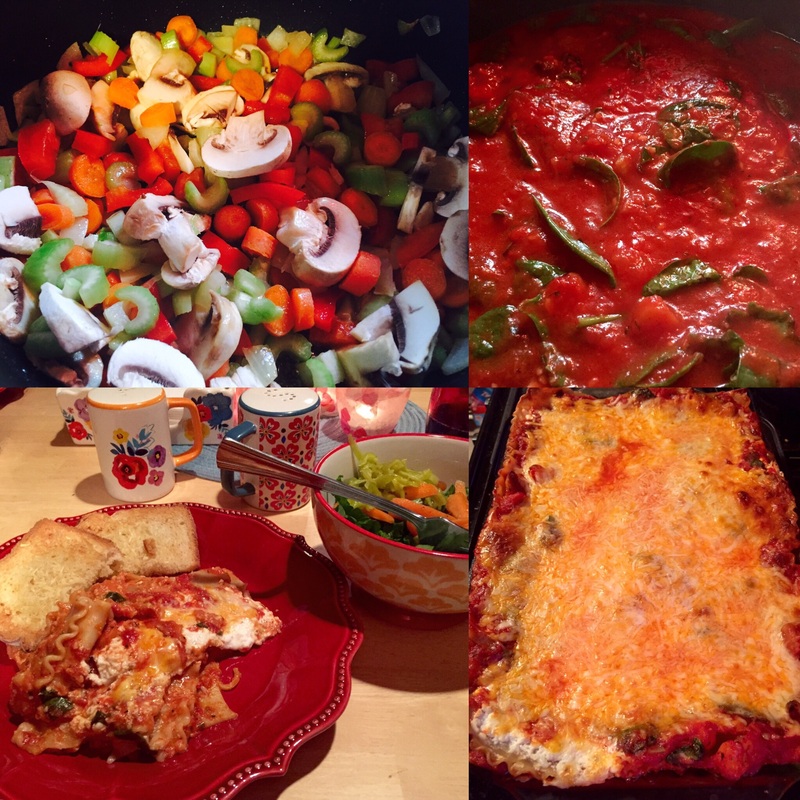 Vegetarian lasagna is a great way to “trick” my family into eating vegetables. They love lasagna! I am wild about our new Pioneer Woman dishes and accessories. In recommitting to my health, I started thinking about all the meals that I used to enjoy but have not made in over a year because I know that John and the kids would not favor them. I have decided to cook them again. John is always willing to help in the kitchen and we will just have to eat two totally different things more often. This morning when I came downstairs after getting ready for work; not only had John made my coffee and pulled my vehicle out of the garage, but he had already put dinner in the crock pot for him and kids (ribs with BBQ sauce). On Monday I roasted potatoes, asparagus, and Brussels sprouts and made sure to make a double batch – so there was plenty for tonight. I had roasted vegetables with a GIANT dinner salad with a veggie patty and a dollop of hummus for extra protein. After dinner I decided that I would prepare one of my favorite tomato sauces dishes to have for lunch tomorrow. As I chopped up the ingredients and juiced and zested the lemon – I could not help envision the Italy that Frances Mayes has fanned out for me in the pages of her writing. Oh, what a delight it would be to select a fresh lemon from a tree and allow its perfume to fill the kitchen. Like the quote I shared at the top of the page – I am often a cook that creates without recipes. Of course, blogging has changed that slightly, but I always recommend that you let your own taste buds lead you. 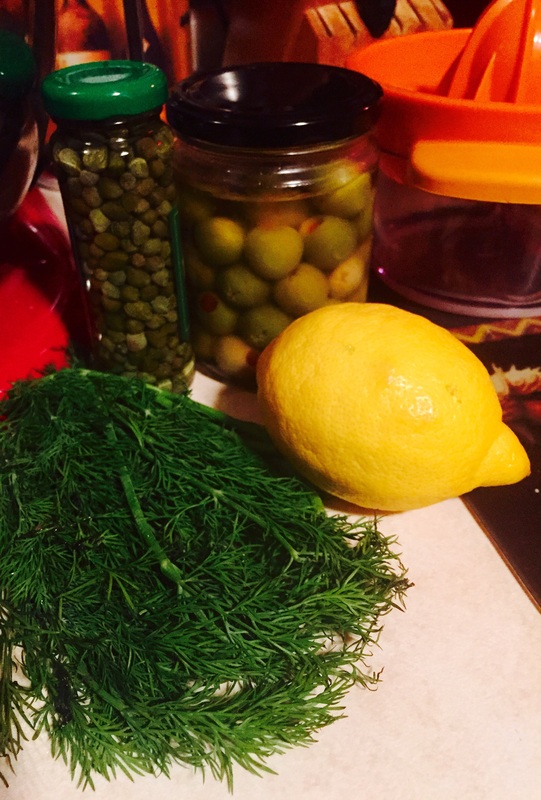 Add as much or as little lemon as you like and season with the amount of dill that satisfies you. My recipes are always a suggestion and I enjoy hearing the tweaks that individuals make to suit their family and their own tastes. 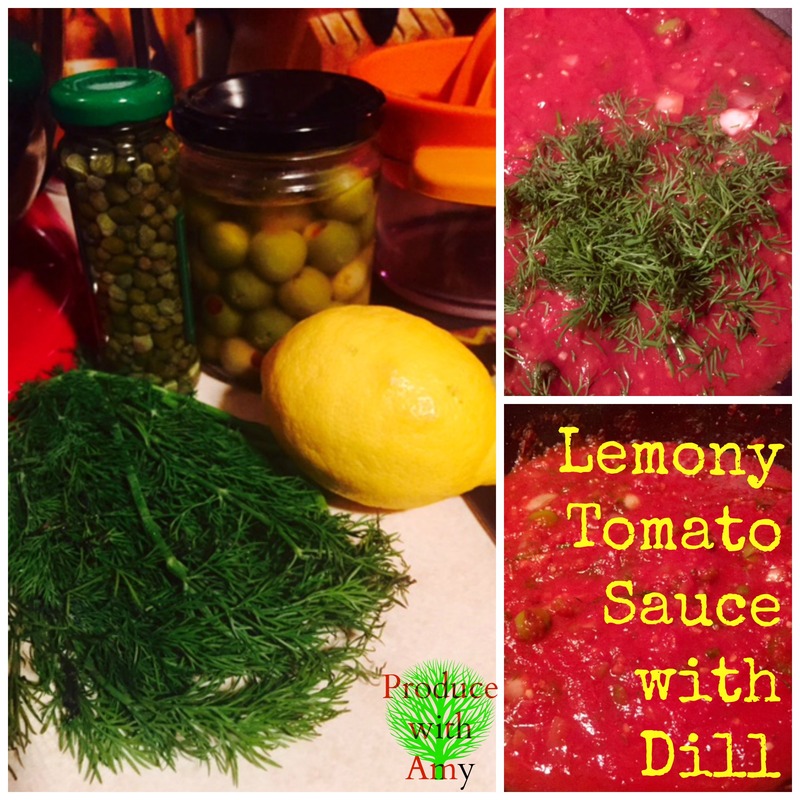 This sauce is great with a variety of olives and I have even been known to chop up some of my mom’s famous dill pickles to add to the sauce. It is fantastic over pasta or zucchini noodles If you eat fish, tuna is a wonderful accompaniment (I have added a tin of tuna to the sauce – or topped with a piece of seared tuna steak). If you are vegetarian or follow a plant-based diet, tender white beans are a fine addition. 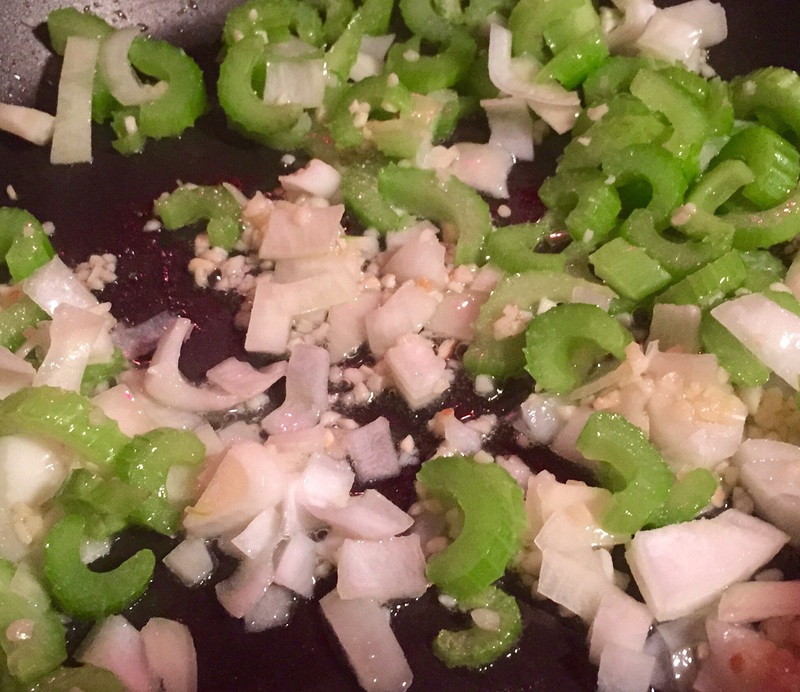 Sauté the onions, celery, and garlic until soft. Add in the tomatoes and simmer for ten minutes. Stir in the olives, capers, dill, and lemon zest and juice – simmer a few minutes to incorporate the flavors. Spoon over pasta or zucchini noodles. I hope that you enjoy this sauce as much as I do. I cannot wait to have it for lunch tomorrow. Incidentally, after my sauce was finished bubbling on the stove – John, who was scrubbing the pans in the sink (he sweetly offered to help without my asking) – eyed the Lemony Tomato Sauce. “Try it,” I encouraged him, curious as to what he would think. “It’s good!” he responded in surprise. He thought it would be a great topping for pasta with seared tuna steak. It looks like I will be adding tuna to my shopping list. I wonder what the kids will think – I will have them try a bite (they love tuna steak). Not only am I changing up my meals and snacks, but this weekend I am going to buy a new multivitamin and add in a vitamin D and calcium supplement. What are your favorite brands of vitamins? I am open to suggestions. It is also at the top of my list to make more time for myself to read for pleasure, write, and focus on my photography. 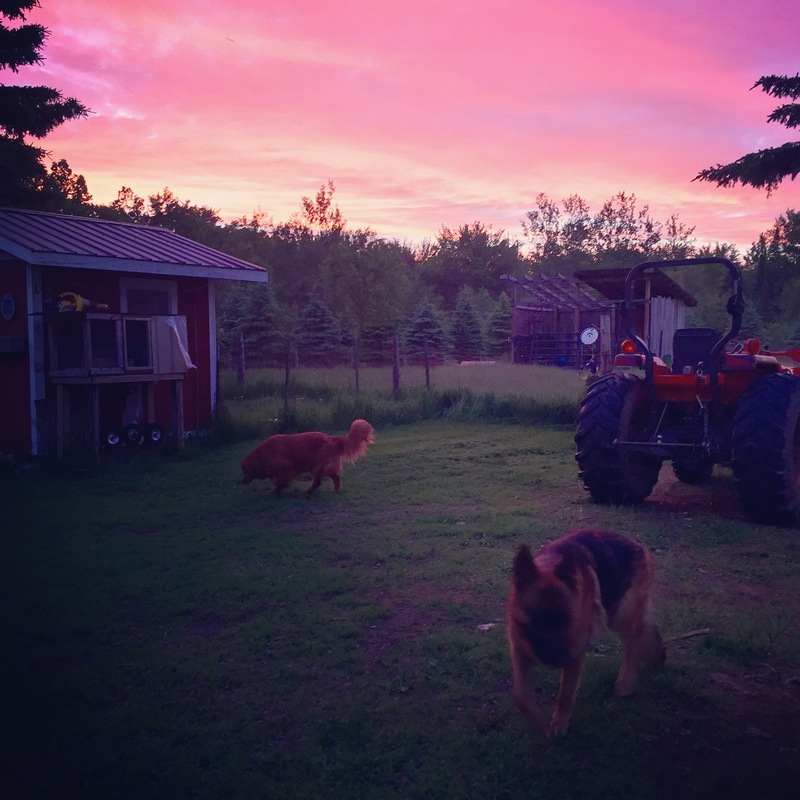 The Upper Peninsula of Michigan has dramatic landscapes in all seasons and I need to capture the beauty of our hobby farm in the winter. 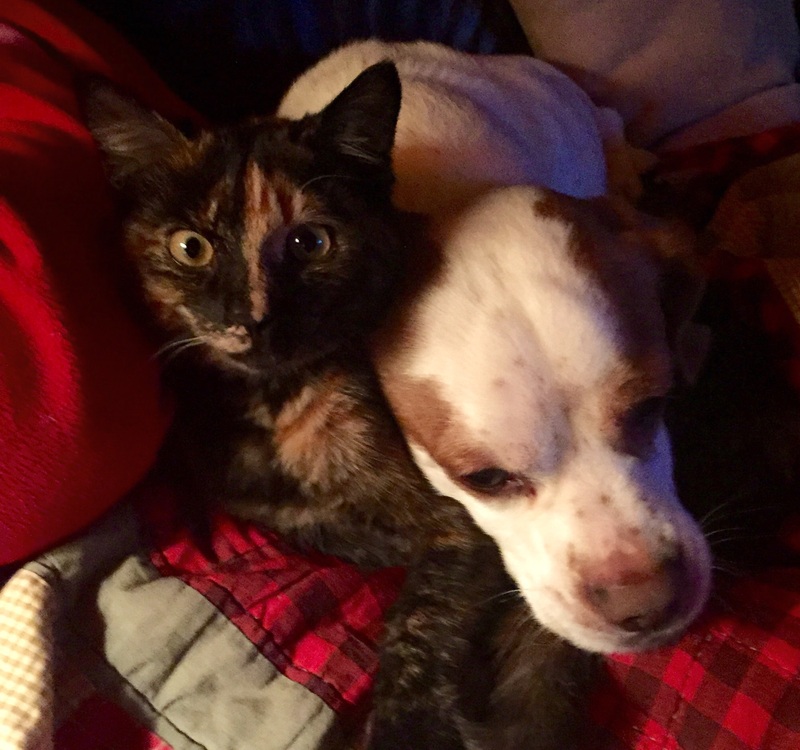 Our kitten Trixie is getting big and Louie loves her so much. Not only do they snuggle together but he growls at the other dogs when they get “too close” to her. 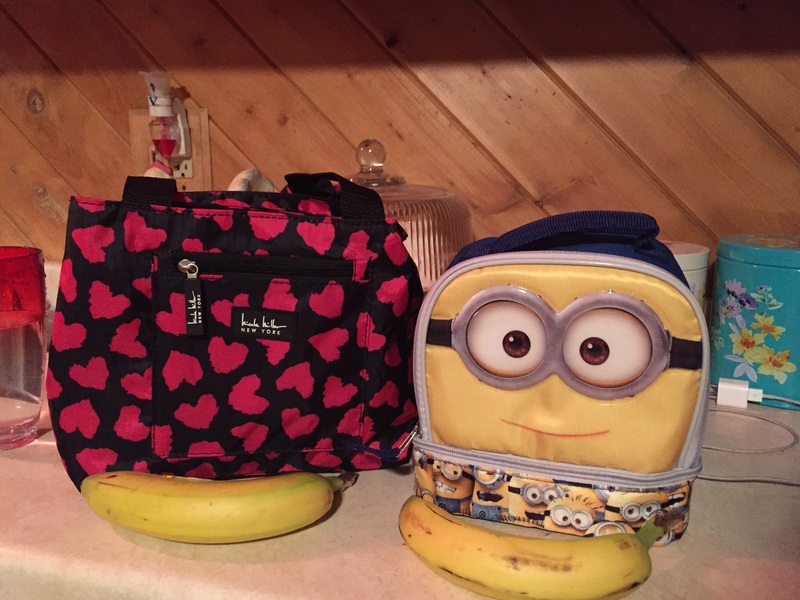 Avalon and Lukas started a mutiny about school hot lunch so we bought them new lunch bags for Valentine’s Day. I always send a snack with them to school but it’s complicated because their school is nut free. I will be scouring Pinterest for healthy cold lunch ideas.